The show actually stated in Davenport, Iowa over radio staion WOC (sister/co-owned station to WHO) and then moved to Des Moines after a year. The 1931 broadcasts of the Barn Dance Frolic were thirty minutes. In 1932 the program was moved to Des Moines. 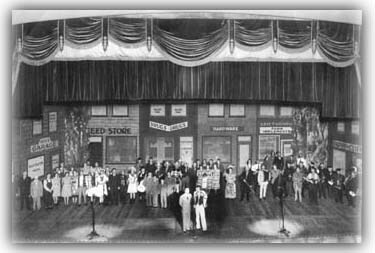 The show originated at first from the President Theater. 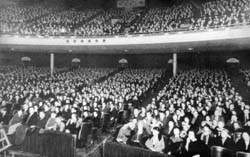 Later, the show expanded to a three hour production, and by 1935 was being held at the Shrine Auditorium which had a seating capacity of 4,200 seats. Many shows at this time were standing room only. 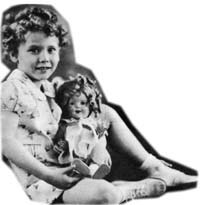 Based upon a review of station information, it appears that by the late 1930s, the show had stabilized or standardized at a 2 hours and 15 minutes broadcast on Saturday nights. It appears that programs were not broadcast during some of the summer months (perhaps July and August, this is not clear). One might suggest that the Barn Dance "stars" were on the fair circuits at that time and combine that with the fact that the auditorium was not airconditioned at that time, too. The Barn Dance continued to be held at Shrine Auditorium after World War II. In the late 1940s, KRNT Radio (Cowles Communications, owned by the same family that owned and controlled the Des Moines Register and Tribune) purchased the Shrine Auditorium. Za-Ga-Zig Temple was forced to sell because of financial problems. 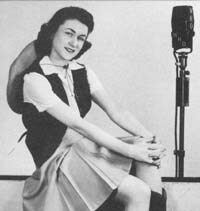 The name of the venue was changed to KRNT Theater, but on the Barn Dance show, it was identified as the "Radio Theater." 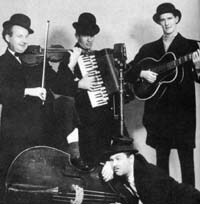 The Barn Dance continued until 1958 when it broadcast its last program. 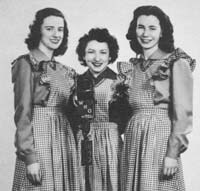 The Barn Dance was also at one time broadcast on co-owned WHO-TV, Channel 13 for a time in the mid-1950s. Based upon information from Bob Williams, one of the directors of the program, the show was conducted in the television studios at 1100 Walnut Street. One of the sponsors was a local Lincoln-Mercury dealer. When you browse the roster of folks and see some of their pictures, you can see the similarity to other Barn Dance shows but still done in a unique way for their local setting. The WHO Iowa Barn Dance Frolic was set in a fictional town of Sunset Corners, for several themes around that crop up for that town. Look at the backdrop on the cast photo above and you can see how the characters wove into the show. Lem Turner's Farm Implements - of Lem and Martha fame. Pappy and Cliff, probably Cliff Carl who worked with Shari Morning as "Mayor Tillie Boggs and Pappy Cliff". It is perhaps unfair to compare them to other shows, but one can't help but notice some similarities, perhaps each of them taking the best from others to find a way to strike a chord with their local audiences. Then there's a drawing in the book of the Sunset Corners Opry House. Sort of like a precursor to fictional towns like Lake Wobegon maybe? 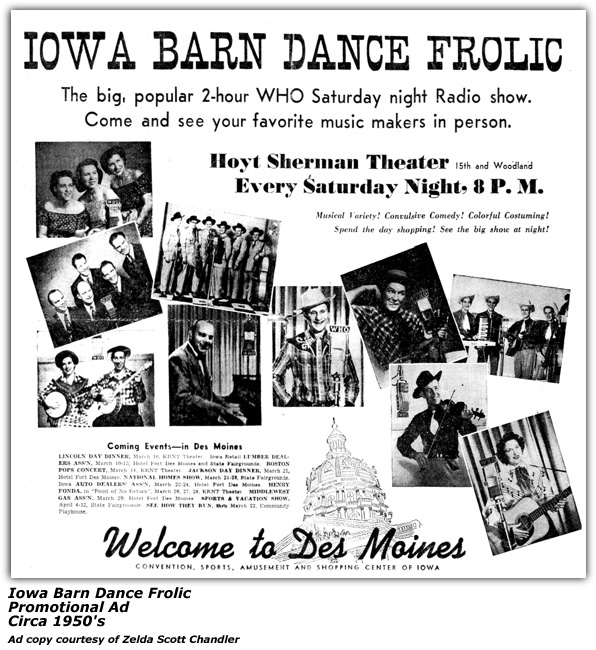 Our correspondents tell us that the Iowa Barn Dance Frolic aired from 8:00pm to 10:00pm every Saturday night. At one time the show was being held at the Hoyt Sherman Theatre. Earlier, the show was held at the Shrine Auditorium. From Radio Station WHO in Des Moines, Iowa each Saturday night, the tunes and and fun would go out to listeners far and wide. The show was staged at the Shriner's Auditorium back then in Des Moines. We learn in the 4th Edition of the "WHO Des Moines Picture Book" that Stan Widney was the producer, announcer and more for the show at one time.